On Saturday 3/27, Juan, Victor, Ethan Gilsdorf (Author of Fantasy Freaks and Gaming Geeks) and Sean Stalzer (President and CEO of The Syndicate) held a panel as part of the PAX East conference. Officially the panel was labeled as: "Why do people love WoW and other MMOs so much? What exactly is it about these games --- killing the dragon? feeling powerful? vicarious adventure? acting out?--- that explains their massive appeal? And how do individual players and guilds behave online, and how might their online behavior differ from the real world?" We didn't know what to expect heading to the panel. Would the room be nearly empty? Would the crowd be interested in the topic? It was hard to tell especially considering when some of the other events had such speakers as Curt Schilling and Wil Wheaton. We were pleasantly surprised to see that close to an hour before the panel was due to start it was already "sold out". So many people lined up to attend it that the line was closed. A half an hour before the panel was due to start they began letting the crowd in. All the seats quickly filled and another 50+ people were able to stand around the edges and the panel was able to begin 15minutes early. The panel itself went great. Ethan moderated it and asked a series of questions across a broad range of topics. The answers stemmed from the premise that most people play MMOs for the social aspect. Social, however, doesn't mean they want to all be buddies and pick flowers together. Social can mean griefing. Social can mean killing each other. Those various aspects of playing were all delved into with anecdotes from Second Skin sited numerous times as examples. Ethan was able to pull from his book research and Sean pulled from 14 years of Syndicate history to share a number of stories to illustrate key points. About 45minutes into the talk, it was time for Q&A. Once again there was that moment of wondering "would anyone stand up and ask anything?" That moment was very fleeting since soon the line had more than 20 people in it. Unfortunately we ran out of time (and we learned we need someone controlling the microphone next time to force the question to be asked with less than 5minutes of back-story and life history) and didn't get to all the questions (sorry Chewbacca! nice costume though!). However, we hung out after the panel and fielded a dozen or more additional questions. For example, Sean was pinned down on tips and ideas to run a successful guild, improve recruiting processes and combat guild drama. To help illustrate how successful we feel the panel was here are two examples. On Sunday, there was another panel about the Future of MMOs that was moderated by MMORPG.COM and was composed of 4 gaming industry leaders. In that panel, our panel was sited multiple times as an example to help illustrate their points. So it was good to see that our conclusions were lining up with those who were leading the industry forward. 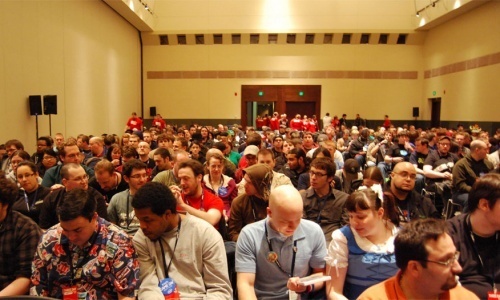 Also, at the airport after PAX, Sean overheard several PAX attendees discussing their experiences when two of them got into a debate over the social drivers for MMOs and they were siting the panel as examples to make their points. So all told, it was an amazing experience that ended up far exceeding our expectations. Thanks to Ethan for setting the panel up and to PAX for allowing us to present it. In addition to the panel we were a part of, Curt Schilling (via his panel) revealed to the world that his company (38 Studios) had been and continues to be working closely with The Syndicate to consult on their in development games.